Holiday and Winter Bouquet Favorites! The most wonderful time of the year means we have an abundance of winter and holiday themed bouquets for sending "Season's Greetings!" Lights shine brighter, our hearts are lighter and everything has a nice joyful sheen to it (except for fallen snow after a day of traffic...but let's not dwell on it right now!). Here to get you in the mood for the holidays I am sharing the bouquets and centerpieces fit for any table, office and/or living space. We are starting out the gate with something brand new from our designers. Maybe it's a favorite because I went to Ball State (Go CARDS! ), maybe the colors OR MAYBE this says Indiana winter to me. There is so much to love about Winter Cardinal! Light blue carnations, delphinium, pine cones, fresh fragrant pine and a little cardinal nestled in a beautiful winter theme container. 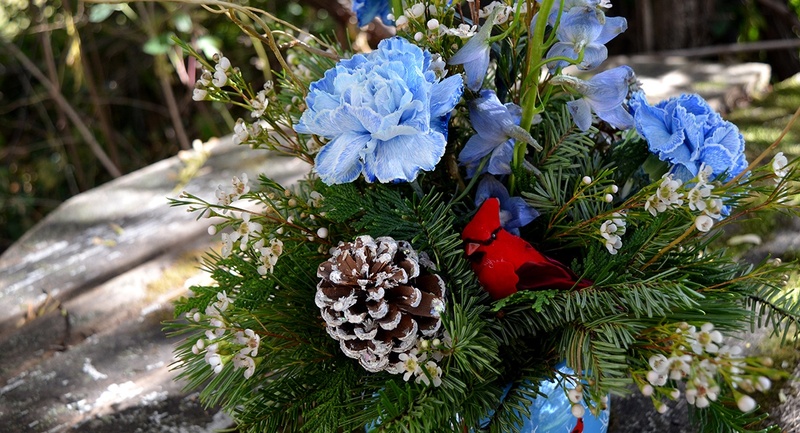 This arrangement brings back fond winter memories complete with bright red cardinals flitting to and fro. Now let's go for something a little more energetic and fun! Do you love candy cane colors? Baskets? Carnations and daisie in holiday colors in a basket? Then Tinsel Twist is for you! 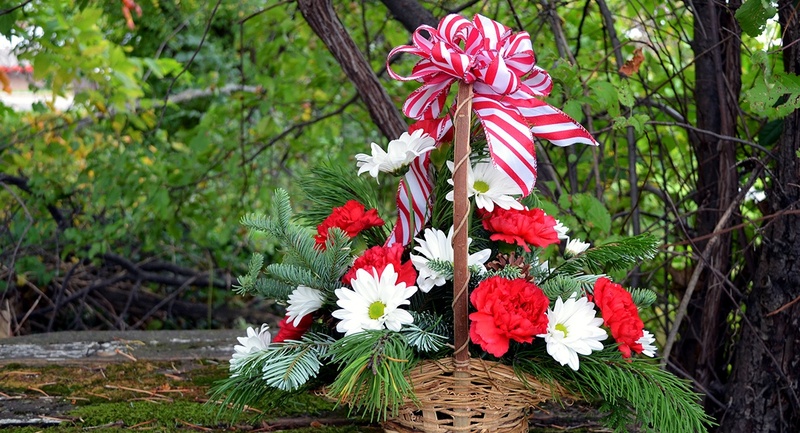 Lively red and white color flowers with refreshing greens topped with a boisterous ribbon all wrapped up in a basket. 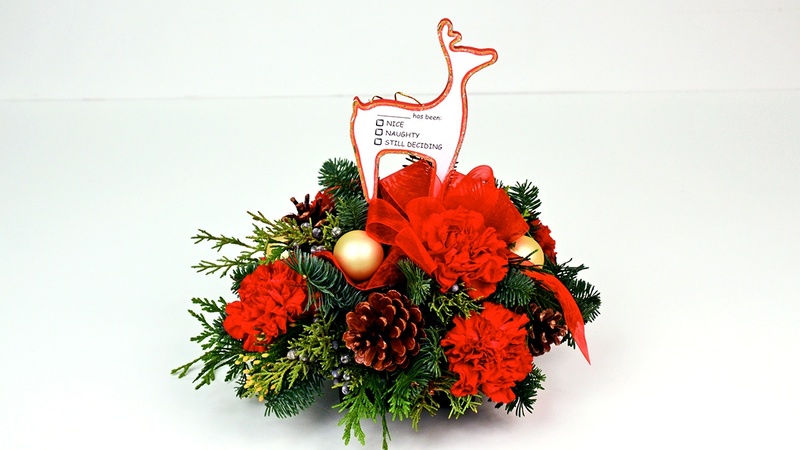 This bouquet says "Joy to the world and have the happiest of holidays!". I get psyched up just looking at it. Now that we are excited, let's take it down a notch with the peaceful warm glow of a golden glass hurricane surrounded by florals in colors of a sugar plum dreamland. 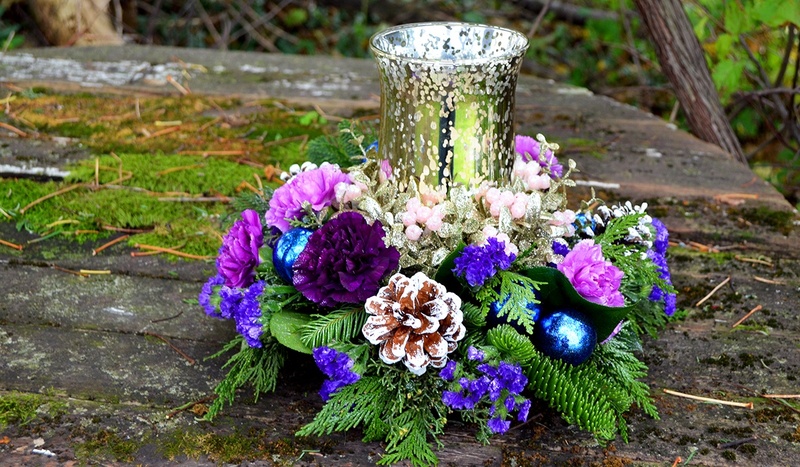 Fragrant and fresh winter pine, pinecones, moon series carnations in shades of purple, purple statice, blue millimeter balls, a votive candle and a touch of silver glitter! A new pick which is becoming more popular are lanterns! They are everywhere but leave it to the fantastic designers at Gillespie Florists to put the perfect artfully arranged spin on this new classic. 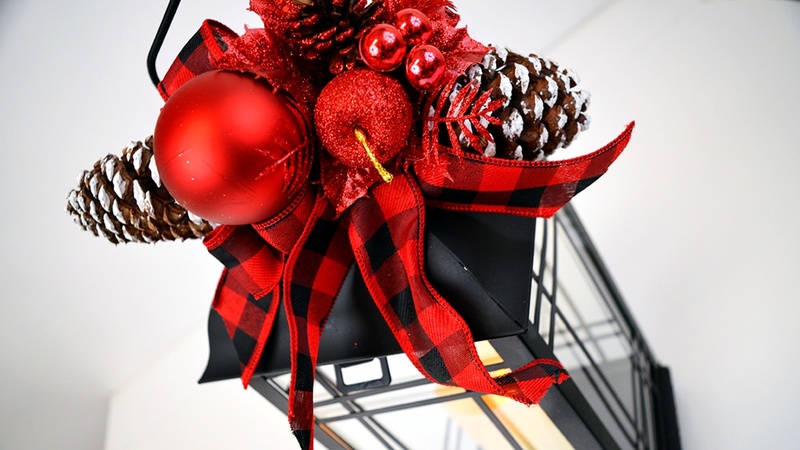 Adorned with glittering red leaves, apple and pinecone, natural pinecone, red and black plaid ribbon, ornament and LED light candle which will warm up any living space! I am sold on this keepsake and can't wait to see the warm candlelight softly illuminating my living room. What kind of list would this be without one of our most traditional winter decor staples? Nothing says "Happy Holidays" like poinsettias! Red, white, pink and now available in shimmer blue, come by our store and pick on up, call us or order online! We have 6", 7", 8", 10" and even poinsettia topiaries in stock. 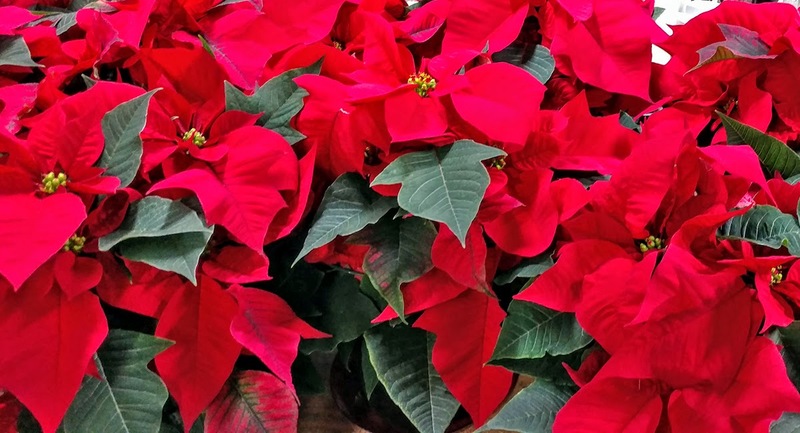 Want to send poinsettias to a loved one with pets? Check out this informative article about pets and poinsettias! We are excited for Christmas and are here to help you have the best holiday season yet. Call us at 317.273.1100 or visit our website to find the absolute best way to send your Season's Greetings to friends, family and colleagues. Happy Holidays! P.S. Naughty, Nice or Still Deciding...Remember Santa's always watching!